In 2007 Tim Chapeau had a vision to start an Electrical Company that provided quality service and work to the Twin Cities Metro Area. Tim envisioned a company that would serve it’s customers with honesty and integrity, no matter if the job was big or small. During the last twelve years M&T Electric has continued its strong commitment to all customers by providing customers with quality work that fits their vision. M&T Electric has continued to be an innovate force in the Electrical Industry in many ways. For example, we are one of the only companies in Minnesota certified to provide GE electric charging stations for electric vehicles. M&T Electric currently has several electricians available throughout the Twin Cities to provide electrical services for your industrial plant, commercial business or private home. We will come to your location and provide a free quote for your project. As your consultant, we work with you to make your vision a reality and to provide you with first class installation. We want to insure that you are receiving the best value, with the most efficiency for your investment. 1) Locally, privately owned small business. 2) Licensed, Bonded and insured in the State of Minnesota. 4) Reasonable prices – We will work with your budget! 6) Fast and efficient service. 9) We stand by our work. Quality and innovative service is the driving force of our business for our employees and the customers we serve. 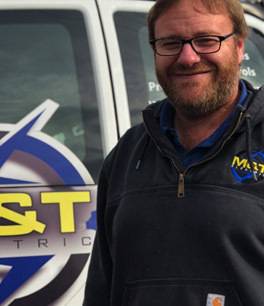 Tim has over 15 years experience as an Electrician. Ever since he was 14 years old Tim knew he wanted to be an electrician, just like his Dad. He learned his craft from his Dad at a young age and then attended St.Paul Technical College to further master his craft. From 2000-2003 Tim worked as an apprentice under the National Joint Apprenticeship Training Committee through his local electrical workers union, IBEW 110. In 2003 Tim took his journeyman electrical test and passed becoming a licensed electrician with the State of Minnesota. Before starting M&T Electric Tim also worked for People Electric, Collins Electric, Hunt Electric, Parsons Electric, Eagan Electric and Larkin Industries. In his many years of doing electrical work Tim has worked on projects ranging from small residential projects to large power plant shut downs and turn rounds to large emergency response projects that require his immediate attention. He is a member of the Local IBEW 110 Union for electricians and is also a part of the National Electrical Contractors Association (NECA). Tim is a certified Master Electrician with the State of Minnesota and Wisconsin.